Next week Auckland Council’s Governing Body will decide whether the chief executive can enter into a public-private partnership to progress the SkyPath project, once all matters are resolved. If the governing body agrees to progress SkyPath under the recommended public-private partnership option, it would be the first partnership of its kind for significant infrastructure in Auckland considered by the council. The partnership would mean that the construction, operation and maintenance of SkyPath would be funded by the private sector for the contract period. This approach would mean there is an admission charge for all users of SkyPath. The council would provide a limited underwrite of the revenue, and assumption of ownership rights and obligations at the end of a contract period. The private sector would manage the project costs, and the underwrite is a guarantee on a revenue stream that underpins the project. The council would not be providing a return on capital for the private sector. The council’s partnership would be with H.R.L Morrison and Co’s Public Infrastructure Partnership (PIP) Fund. The New Zealand Transport Agency (NZTA) is the custodian of the Auckland Harbour Bridge and would need to provide a licence to occupy for SkyPath to be attached to the bridge, like the AJ Hackett bungy jump facility. As well as funding, the project needs resource consent to proceed. A resource consent was granted in July 2015, however the decision to grant was appealed by three parties and is currently progressing through the Environment Court process. As the next step in the technical investigation of the project, wind tunnel testing was undertaken and it did not identify any significant concerns. The governing body will make a decision at its 25 May meeting. Due to commercial sensitivity of the public private partnership, the decision-making will be made in the confidential section of the meeting. SkyPath is a proposal by the Auckland Harbour Bridge Pathway Trust to construct a combined pedestrian and cycle pathway across the Waitematā Harbour. The project would complete a critical gap in Auckland’s walking and cycling network. It would be accessed via Northcote Point at the northern end of the bridge, and Westhaven in the south. It would connect to other cycling and walking facilities at each end. 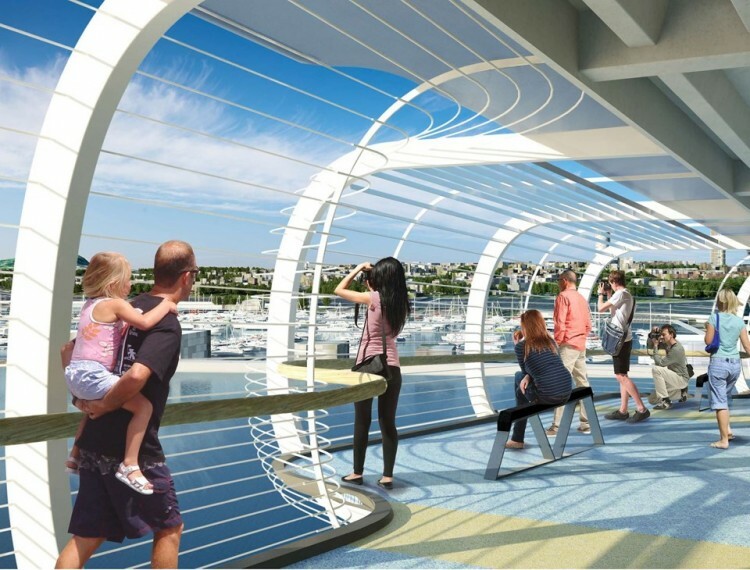 SkyPath would be used by commuters, recreational users and tourists. It would be a major attraction for residents and visitors to Auckland, offering a unique perspective of the Waitematā Harbour.